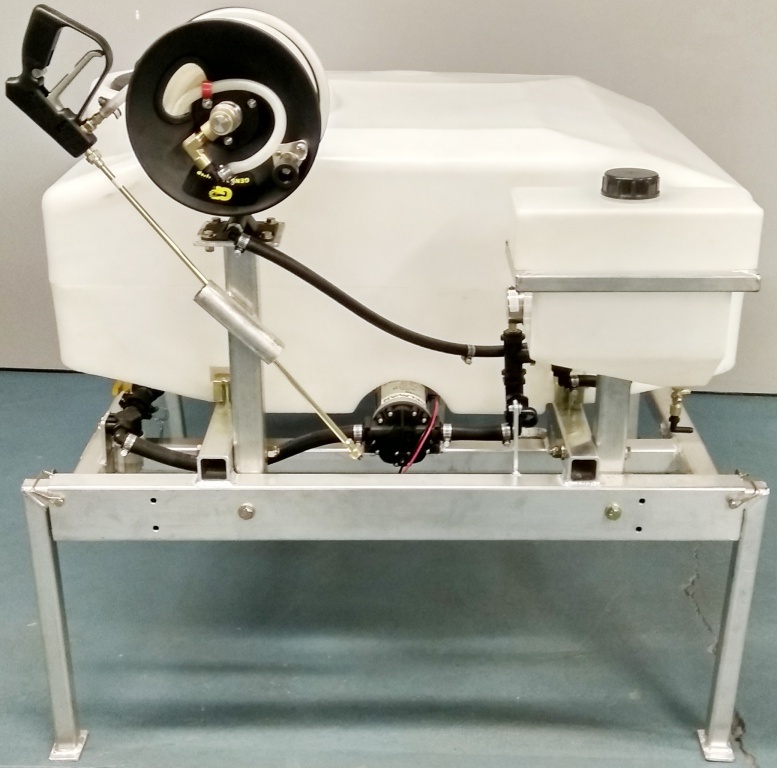 This skid frame comes standard with a 100 US gal (378l) tank that mounts securely into the back of most utility vehicles. Built entirely out of aluminum, the unit is impressively light making it extremely easy to move around. When not in use, the SMA100E stands alone on its own legs for storage (legs fold up nicely along frame when mounted in a vehicle). A high capacity 12v electric pump is standard. Optional Honda engine/pump or hydraulic driven ACE pump can be installed from factory. Note that SMA50E/100E are not complete sprayers. They need to be attached to other Booms. See the BK Series Boom, available in 10' (3m) or 12' (3.6m), and wind deflector kits for a complete sprayer package. The BK Series is also available in 20' (6m) or 26' (8m) open boom widths with electric fold. The Hose Reel Kit is a very handy device that allows the operator to spot spray directly from their SMA series sprayer. Includes spray gun, manual hose reel, 50’ hose, and necessary fittings to tap into existing plumbing.